Charming, in every way. 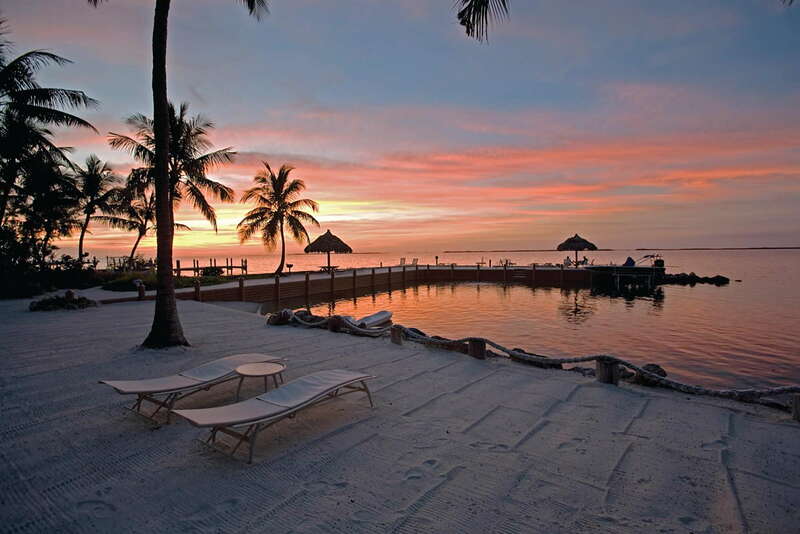 Step out the door of your cottage and onto brick-paved walkways that lead to a private beach on the Florida Bay. Oh, that view! Should you play ping pong by the water? Read a book in a hammock? Or get a massage amid the fauna? So many decisions, so little stress. There are no resort fees at Kona Kai. 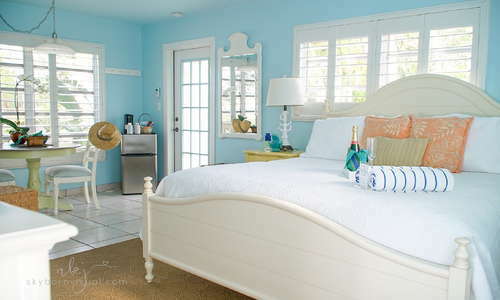 Guava, Kiwi, Mango… all 13 pastel-painted cottages are named after tropical fruit, and all are downright enchanting. Keys-touches are everywhere from the coral chandeliers to the local artwork. You even get key lime taffy as a welcome gift. The TVs may be small, but you can find your jam with a CD player--and a stack of CDs by local musicians. Wolfgang Puck coffee and Revolution herbal tea are provided. We also love the soft sheets. 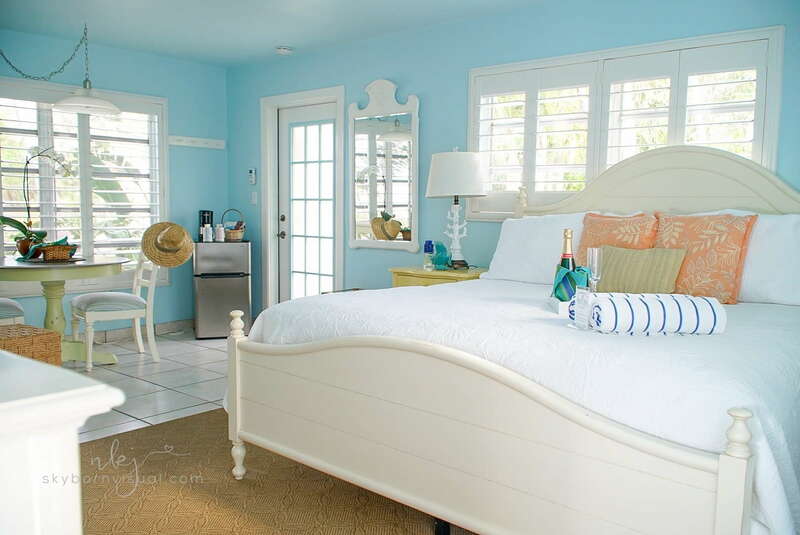 The Breadfruit cottage is closest to the water, with a full kitchen and a king-sized bed. While some are on the small side, they do have somewhat updated tile, walk-in showers with glass block, and the most wonderful key lime scented soaps, and H20-brand shampoos and lotions. Towels are plush and there are plenty of hooks for wet swimsuits. The lobby is inside their art gallery. Follow the coral rock-lined path past the fan palms and enter the beautiful, glass casement doors. Come for a glass of wine between 5 p.m. to 6 p.m. to start your evening. This is one refreshing freshwater pool, kept at a cool 78 degrees in summer, and 88 in winter. Lounge in the sun or the shade, or hang out in the hot tub. You’ll find beach towels and a fridge stocked with cold bottled water and fresh fruit poolside. No spa onsite but you can book a massage and enjoy it on the grounds or in your room. There is no onsite gym. The only onsite dining is a light breakfast served in the meeting room each morning. No bars on onsite but you can get a glass or two of free wine in the lobby between 5 p.m. and 6 p.m. There are only two frost-free tropical botanic gardens in the entire continental US, and Kona Kai is home to one of them. 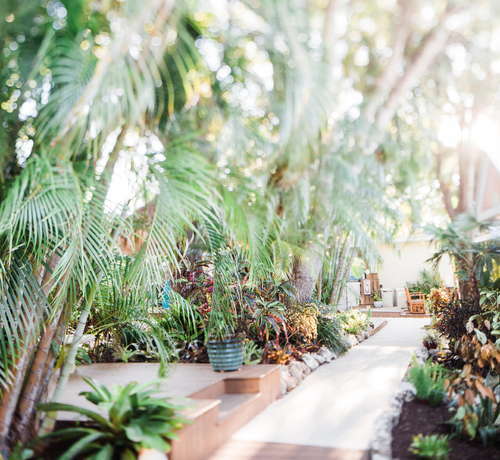 Guests can take a free tour with the staff botanist and see 250+ species of tropical plants. There’s also a lighted tennis and shuffleboard court, kayaks, and a paddleboat for you to use at no charge. YOU SHOULD KNOW The tour is free for guests but they do encourage donations. If you're not a guest, you can still book a tour but it will cost you $25. The best way to explore Key Largo (since it’s so big) is by car. And if you want to head further south to Islamorada or even Key West, a car is a must. If you’re going out for drinks, an Uber or Taxi is the smart call to make. A local favorite for stone crabs in season is Ballyhoo’s (two-minute walk). Try Harvey’s fish sandwich, too (blackened is fantastic). For the best breakfast, go early to Harriett’s (two-minute drive) but be prepared to wait. Everyone loves their homemade muffins. The Fish House (7-minute drive) is renown for the freshest of fresh seafood. Order your fish Matecumbe-style and have a slice of key lime pie. The Fish House Encore (7-minute drive) has an outdoor patio with live music and good martinis. Skipper’s Dockside (5-minute drive) has an outdoor Tiki bar overlooking the marina, and indoor bar with a wall of TVs, and a great happy hour. For late night fun, hit Hog Heaven (15-minute drive). Play pool, sit by the ocean, or just have a beer and a bbq sandwich. This small, adult-only resort was made for peaceful escapes with its amazing gardens and private beach on the bay. And if you’re longing for a bit of pampering, let the concierge book you a massage or a beachside yoga session. But, if you’re looking for wild days and nights, look elsewhere as your only hope is spotting a gecko or a curly-tailed lizard. These days, it seems peace is hard to find, but at Kona Kai, it’s a daily affair. 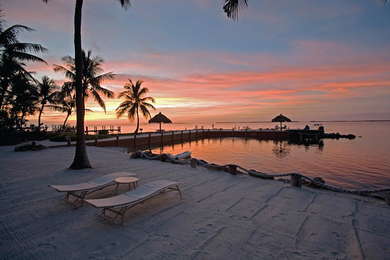 So is sipping wine on the dock and reveling in yet another amazing Key Largo sunset.